Inflation and prices are on the rise, there is a shortage of foreign exchange and supplies of fuel, food and pharmaceuticals are drying up. The opposition is calling for a transitional government to resolve the worsening economic and political crisis hitting Zimbabwe. President Emmerson Mnangagwa is increasingly under pressure to act swiftly. On Monday, October 29, 2018, Mnangagwa met with the country's business community. The president assured them that he was "working day and night to stabilize the economy." 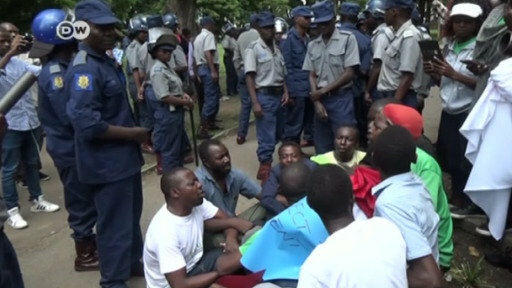 Signs in Zimbabwe are pointing to a possible rerun of the massive crisis that engulfed the country about a decade ago. Among them is a sudden surge of the country's stock exchange's industrial index in October, which now stands at the relatively high market valuation of $22 billion (€19.3 billion), a sudden gain of more than 50 percent in a matter of days. According to the market's spokesperson Tapiwa Bepe, the surge is a consequence of the country's profound crisis. "The political and economic environment is volatile. The heightened activity on the stock market was therefore investors scrambling to take positions in real assets by disposing of cash and bank balances," Bepe told DW. Foreign investors and national investors believe that stocks and shares offer more security. But brokers like Itai Chirume say it has become extremely difficult to take out money locked in electronic bank balances from the stock exchange. "What we have seen is that foreigners have been taking their money out through the medium of fungible shares," investing them in foreign companies, he said. That way the money is leaving the country through legal means. The situation was acknowledged by President Mnangagwa: "The fear to lose wealth and savings as happened during the 2008 economic meltdown is current but unnecessary. I greatly appreciate and understand all your concerns and anxieties," he told the business community. The 76-year-old leader said that Zimbabwe would continue using the multi-currency system which the country adopted in 2009 after abandoning its worthless currency. But the hard currencies – mainly the US dollar and South African rand -, making up the system together with government issued so called bond notes, have been hard to find lately on the formal market. And many in Zimbabwe believe that the time has come to scrap bond notes altogether. Economist John Robertson explains why it is a mistake not to: "The existence of the bond notes caused the US dollar to go out of circulation." An end to the bond notes would bring back in the US dollar, which would be good for the economy, Robertson told DW. Bond notes, a currency Zimbabwe started printing about two years ago to ease cash shortages and help fight hyperinflation, have been losing value lately. They were supposed to trade at par with the US dollar, but are now almost four against the greenback. Some aspects of Monday's meeting displeased the business community. Sifelani Jabangwe, president of the Confederation of Zimbabwe Industries, was upset by Mnangagwa's claims that manufacturers are hoarding stock so as to be able to increase prices. "If anyone is holding back his stock, it is probably because they are waiting to understand the direction (of the economy)," he told DW. Jabangwe went on to explain that many companies have run out of raw materials themselves. "And the panic buying did not affect only customers, it also affected industrialists. Just recently, there was panic buying even of cars." Zimbabwe's president, Emmerson Mnangagwa, has cut short a trip seeking much-needed foreign investment and loans after 12 people died in protests at home. Many Zimbabweans are struggling to survive on paltry salaries eroded by runaway inflation.